Of course there's no logic to that kind of thinking. I'm glad I finally gave The Orchardist priority status because it's a great book. The fact that I first heard about it two years ago did nothing to diminish its quality. Obviously. Because that's not actually a thing outside of my crazy head. In Coplin's debut novel, a man named Talmadge lives alone, tending his apple orchard in a secluded corner of the Pacific Northwest. After his father died in a silver mine, Talmadge and his mother and sister traveled on foot until they reached this idyllic valley. Now his mother and sister are gone, and Talmadge lives quietly, pruning the trees and selling his fruit at a stand in a nearby town. One day, two girls who have been lurking around town steal some of Talmadge's fruit from his baskets. When they turn up again in his orchard, he finds himself leaving food out for them instead of chasing them off. Maybe it's because he still misses his sister, whom he hasn't seen for years. Maybe it's because the girls seem wild, desperate and alone. Maybe it's because they're both visibly pregnant, and even though he doesn't allow his thoughts to dwell on it, Talmadge knows it's evidence that they've suffered wrongs he can't fathom. This isn't a clear-cut savior story, in which Talmadge opens his home and heart to the girls and they become a happy little family. No matter how generous or willing Talmadge might be, some damage can't be undone. Some people can't be saved. Sometimes all you can do is watch and pray as they try to save themselves, in their own halting, broken way. Coplin's style reminded me a little of Cormac McCarthy's. As you might know, I've been campaigning for years to land a job as McCarthy's housekeeper/scullery maid/coffee fetcher, so that's high praise. Talmadge, a man of intense solitude encasing a broken, grasping heart, seemed like the kind of character McCarthy would write. 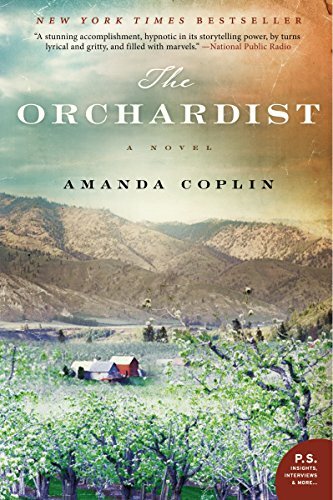 The Orchardist doesn't deserve to be at the bottom of anyone's list. TagsA Touch of Melancholy, Abandonment Issues, Bittersweet Life, Family is Who We Choose to Love, Feeling Big Feelings, In the Jailhouse Now, Journey to the Past, Mamas and Papas, Out For Revenge, People Controlling People, The Natural World, You Think Your Childhood Was Screwed Up?